His book shows how he found his calling, starting from one pivotal event. Feeling lost, a restaurant manager felt life’s emptiness. 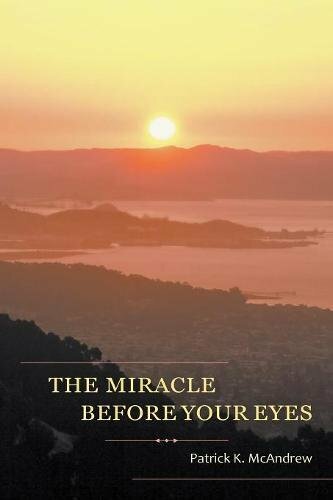 The Miracle before Your Eyes is Pastor Patrick K. McAndrew’s memoir on exploring his inner being and discovering life’s miracles. Before his ministry, Patrick worked as a manager for an acclaimed restaurant. His book shows how he found his calling, starting from one pivotal event. While sitting in silence by a lake one day, he had a realization that opened his eyes to the miracle of life that exists before all people. “He puts his pastor’s heart and the message of his Unity Church together to produce a book that expands life, gives hope, and is beautifully readable,” John Shelby Spong, author of Jesus for the Non-Religious, writes. Join Pastor Patrick and discover The Miracle before Your Eyes. Patrick K. McAndrew earned his psychology and business management degrees in 1976 from James Madison University in Harrisonburg, Virginia. He was ordained as a minister by the Unity School of Christianity in 1997. He served in the ministry for several years before completing his doctorate in religious studies from Emerson Theological Institute in 2017. Presently, Patrick lives in Oklahoma City, leading a vibrant ministry in the area. He has a daughter who recently graduated from Florida State University with a Master’s Degree in Digital Humanities and is the Communication Director at Goodwood Museum In Tallahassee, Florida, where she lives with her husband, a middle school teacher. His daughter is also a certified music teacher, a violinist and vocalist. Learn more about the author and his work at www.patrickmcandrewbooks.com.